Kent Humm says he agreed to put a wind turbine on his land because of the environmental benefits. He's a fifth generation farmer. He raises corn, soybeans, wheat, and now wind. Humm said the sound of the turbine doesn't bother him. 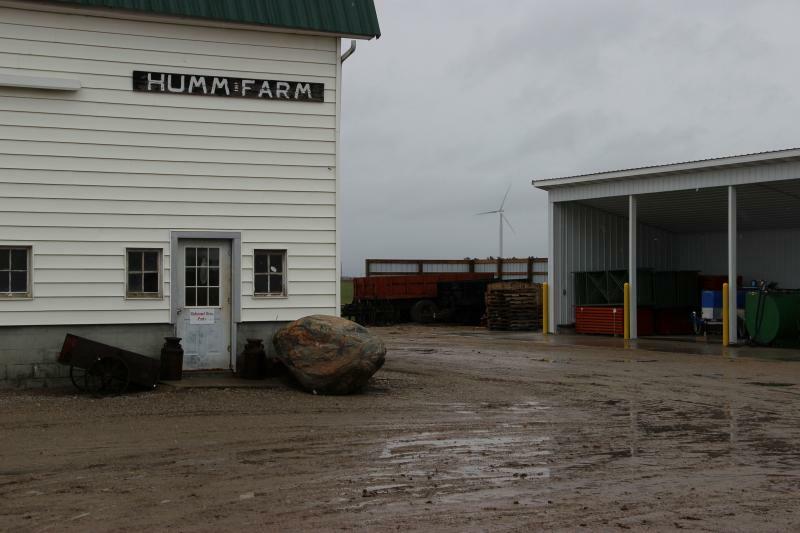 The Humm family has several turbines on their land. DTE Energy owns 64 of the turbines, and Invenergy owns 69 of them. There are per acre payments and royalties from the power companies. You're paid for turbines on your land, and for cables running underground. The turbines make a low whoosh sound as they spin. The stand more than 450 in the air. A few of the turbines from State Highway 127. 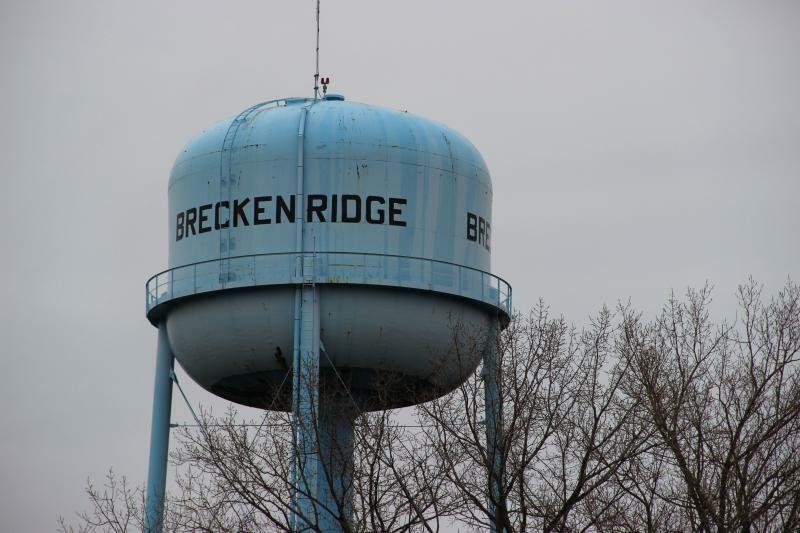 Breckenridge sits in the middle of Michigan's largest wind farm. The town is also close to the center of the lower peninsula. Before the windmills, the town was known for its grain elevator. Listen to the radio version of the story. The Gratiot County Wind Farm has 133 wind turbines scattered over more than 30,000 acres. 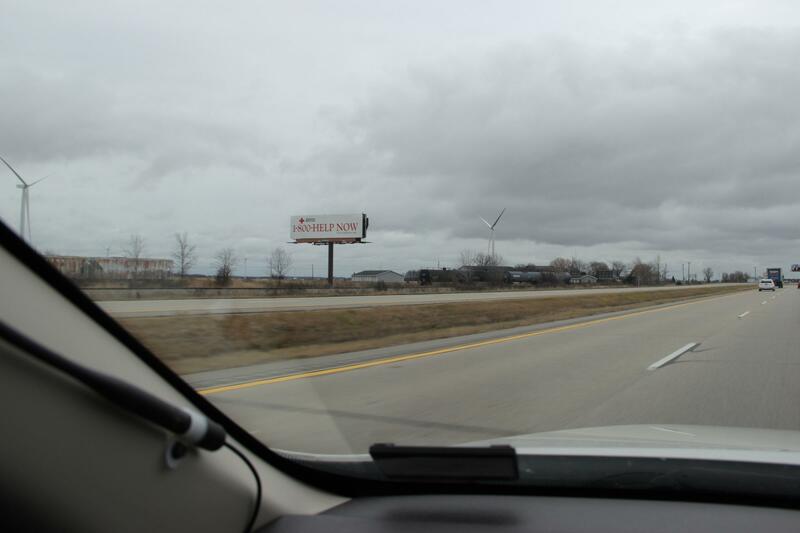 It's the largest wind farm in Michigan. Each 1.6 megawatt wind turbine can generate enough power for 350 homes. 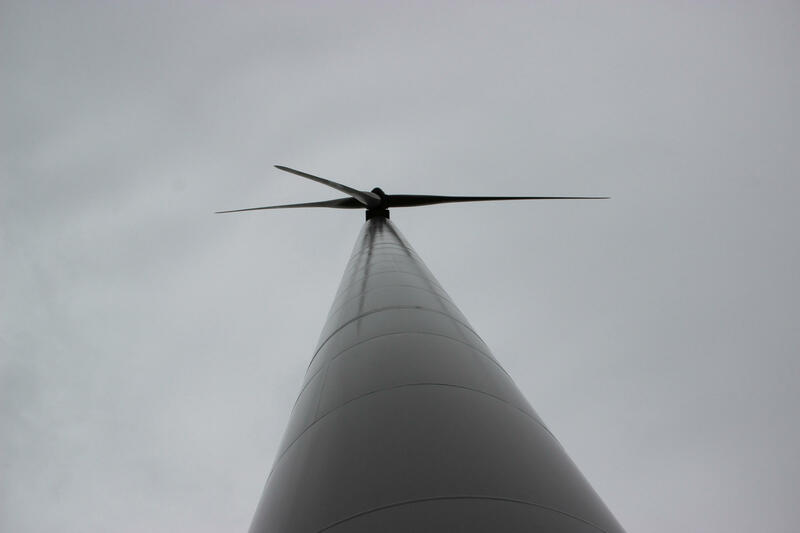 And this is what it sounds like when you stand directly beneath a wind turbine that stretches more than 450 feet into the sky with the wind blowing between 10 to 15 mph. Invenergy owns 69 of the turbines. DTE owns 64 of them. All the power that is produced here goes onto the grid for DTE Energy, which means the power generated in central Michigan goes to southeast Michigan. 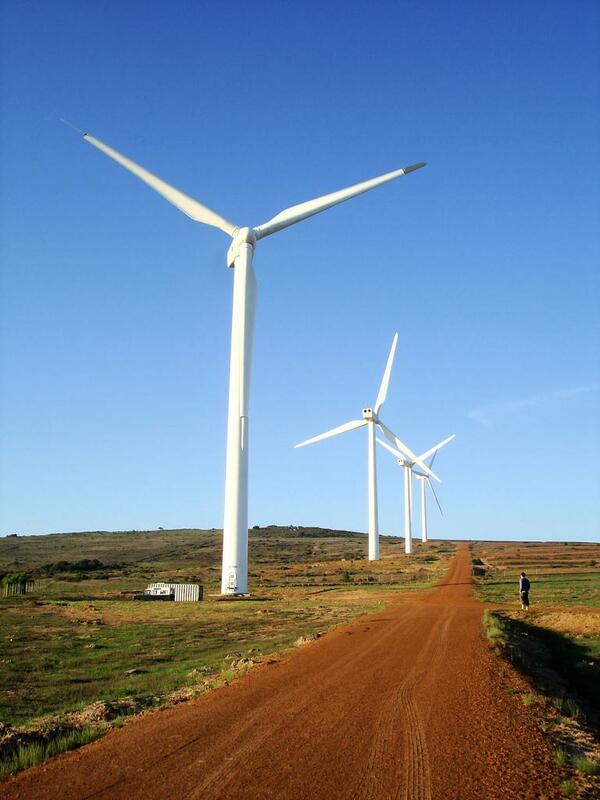 The wind farm produces a total of 212.5 megawatts of renewable energy. Power companies in the state are required to generate 10% of their energy from renewable sources by 2015. 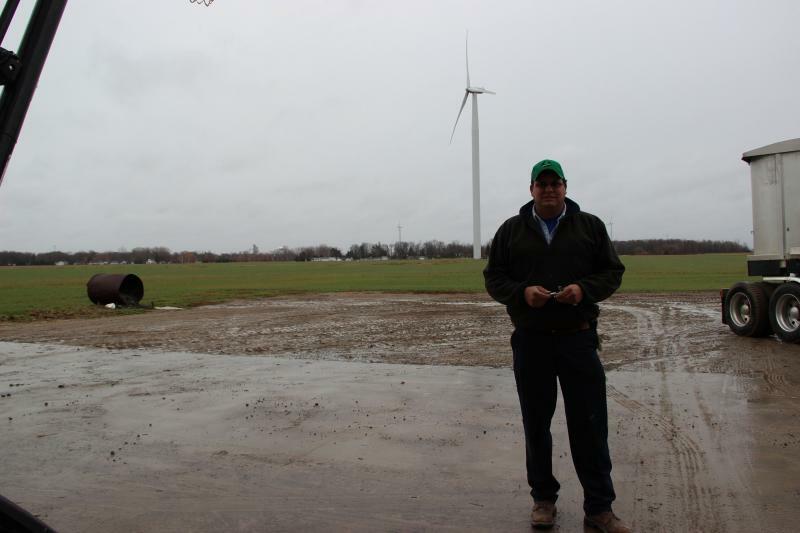 ...the Gratiot County Wind Farm represents around 22% of the renewable power DTE generates today. 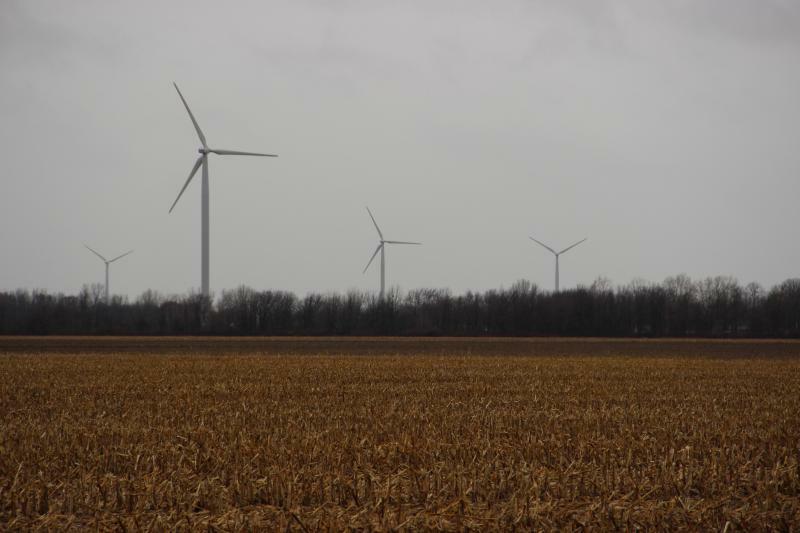 DTE Energy spokesman Scott Simons says the company is close to that goal, and the Gratiot County Wind Farm represents around 22% of the renewable power DTE generates today. More of wind farms are going up around the state, so I wanted to know what it’s like for the people who live here. 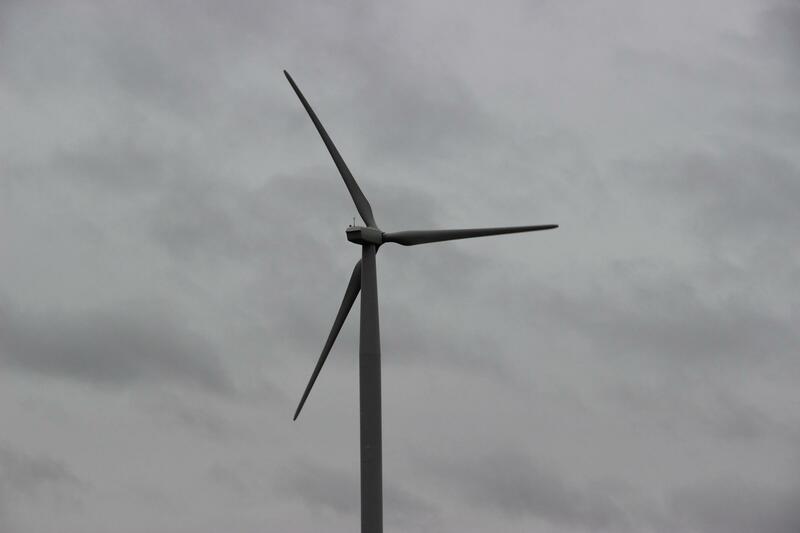 The wind turbine I recorded above sits on the Humm family farm in Gratiot County. The wind farm started producing power for the grid last year. 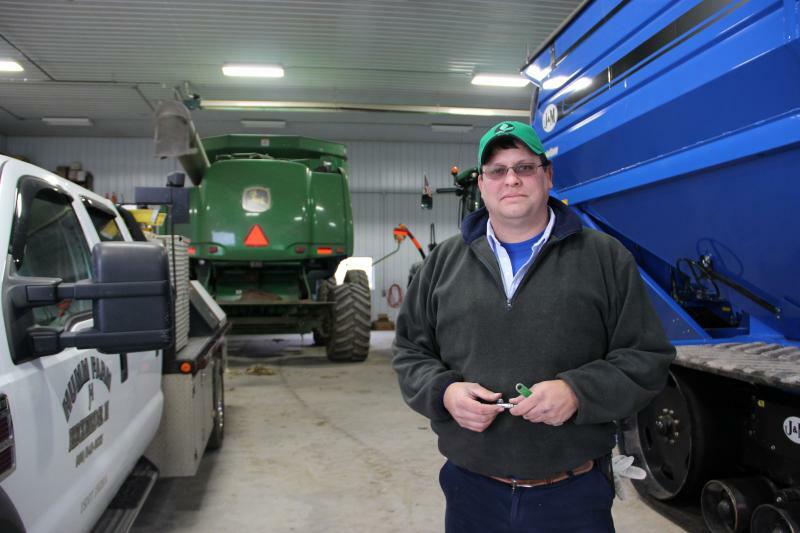 In the radio story above, you can hear Kent Humm describe how he learned a lot about how the wind moves around his farm once the wind turbines started spinning. 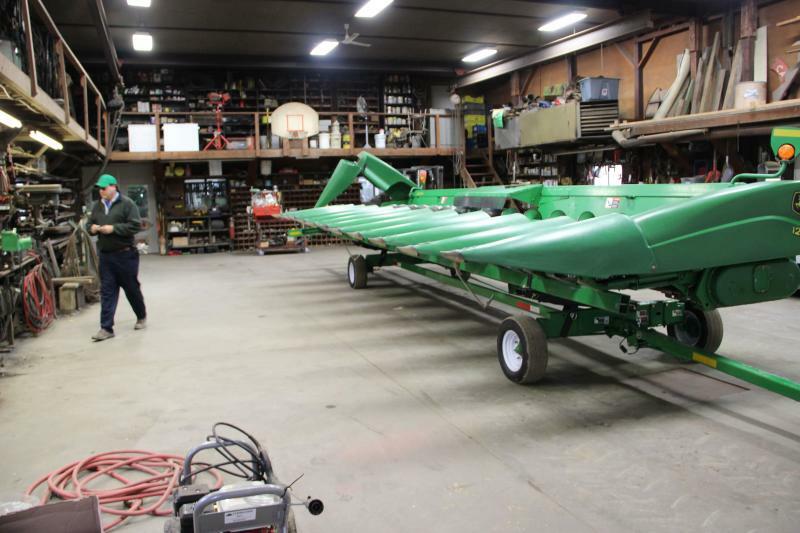 He says he'll use the turbines to get a sense for where they could be spraying their crops. They want to spray where wind speeds are low. The turbines, which can be seen for miles around, give them an indication of where they can spray. The sound, he says, doesn't bother him. He calls it low background noise, and says he can't hear it inside his house. It wasn't a proper poll, but I was introduced to a group of farmers and their spouses sitting around a big table having lunch in Anschutz Cafe. It's the main diner in town. Most were supportive of the turbines. Marilyn Myers has been in this area her whole life. She said the same thing Kent Humm did - that the sound is something you get used to. She said they have the windows open in the summer and it the sound doesn't bother them (even when the turbines engage their brakes to slow the blades down in high winds). She said some were open-minded when the wind farm was being proposed, and others weren't. "But, like we laugh now, that check coming in helps us out." "When they were signing people up, the person was either just dead set against it. Didn't want nothing to do with it. Didn't want to ask questions. And then the next person was agreeable," said Myers. "But, like we laugh now, that check coming in helps us out." There are around 250 families in this area that receive payments from the power companies that use their land. Nancy Shankle’s family is one of them. They get per acre payments, and royalty payments off the power that is produced. And Kent Humm said the community went a long way in making sure everyone in the community got the same deal. Landowners get quarterly per-acre payments if the power company has a wind turbine on your land, or cables running underneath it. According to Humm, payments can range from $70 to $75 per acre per year for land with cables underneath, to $300 per acre per year for land disturbed by a wind turbine. 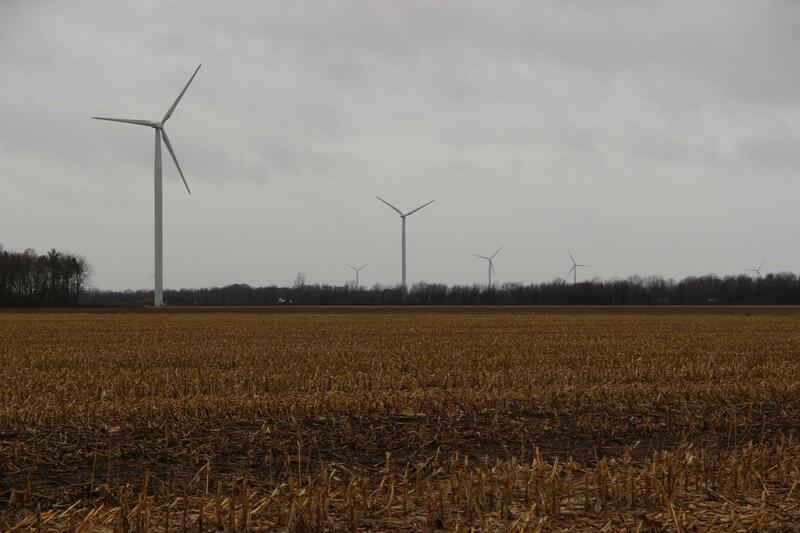 And that seems to be a big reason for the support of this wind farm in Gratiot County. 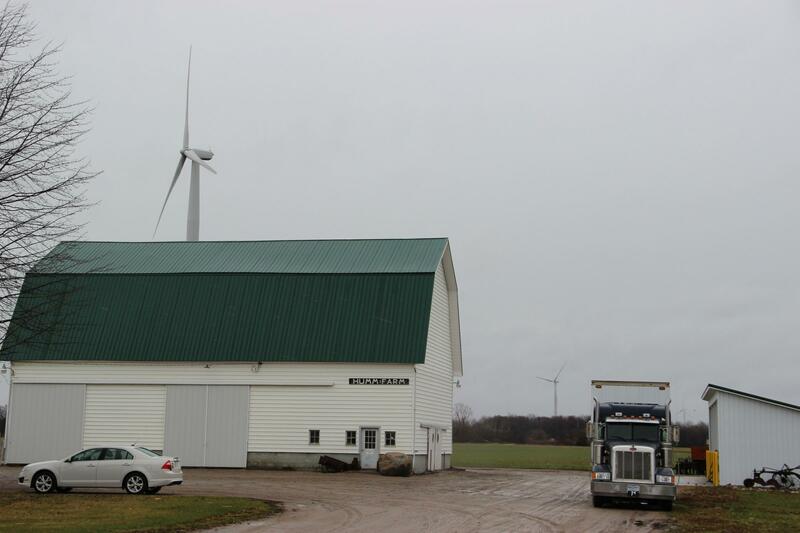 Many of the farmers in this area have a small stake in the commodity of wind. Residents in Manistee and Benzie counties are receiving surveys in the mail this week. The survey will ask questions about wind energy. Christie Manning is a visiting professor at Macalester College in Minnesota. She’s supervising the survey. Township officials will use the survey results to help them with future zoning decisions. There’s also an online version of the survey that’s available to anyone who lives in Michigan. 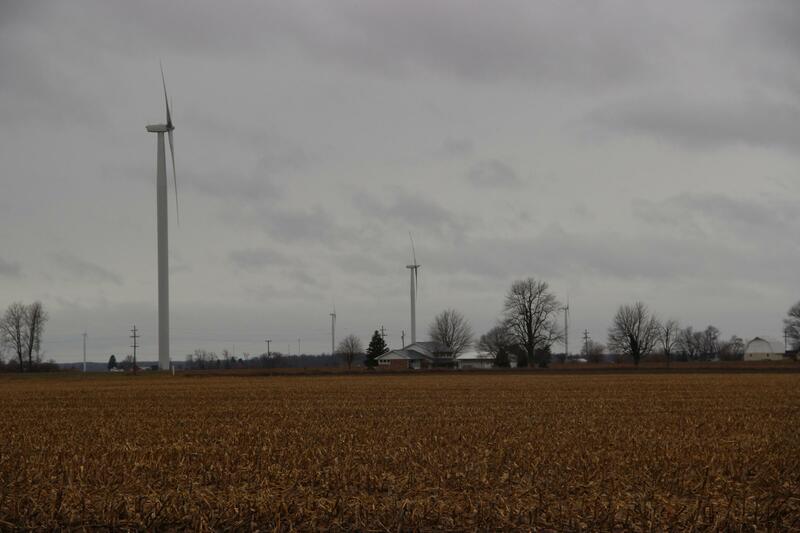 The City of Holland is backing out of plans for a potential wind farm. 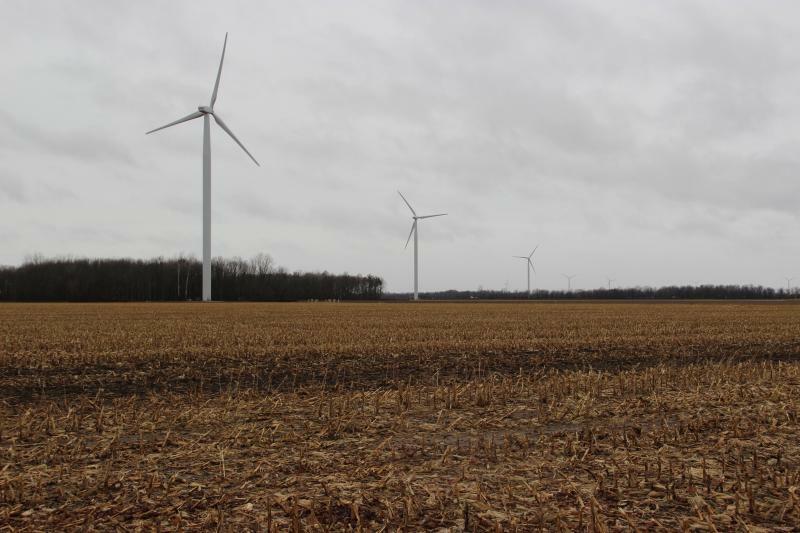 The city-owned utility bought the option to lease hundreds of acres in Allegan County after the state identified the area as one of the best in Michigan for wind energy potential. But after more than a year of serious study, the city doesn’t think there’s enough potential to build the wind farm. 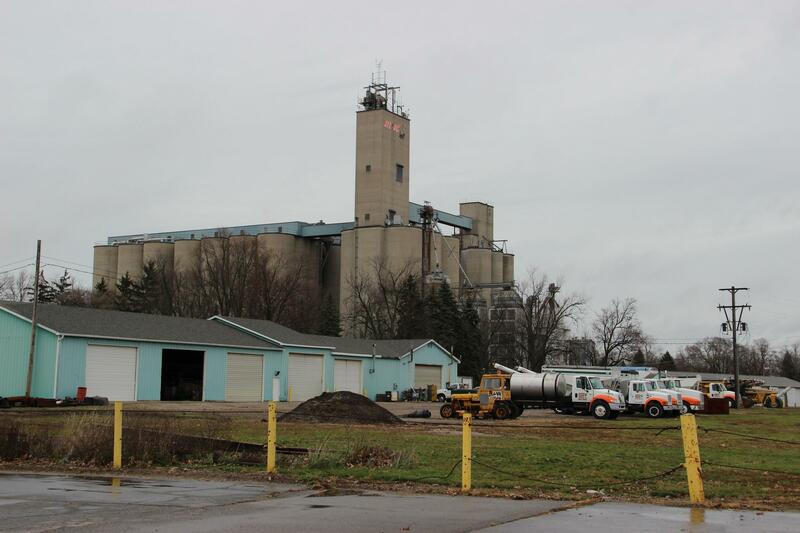 “When we went into this, everything looked like it was going to be a good project to pursue,” said Dan Nally, who directs business services for Holland’s Board of Public Works. "We shouldn’t take the fact that this project doesn’t go forward that we are not supporting renewable, because we absolutely, positively are. But we will also, at the same time, get the best value that we can,” Nally said. The wind was good, but not as strong as they had hoped. The plan was to have a 20 mega-watt wind farm-- relatively small compared to large scale commercial projects. Nally says the utility has spent roughly $678,000 to collect wind data and study the impact on birds, bats and wetlands. "We don’t feel that any of this money has been wasted. It’s been an investment in understanding what we could and could not do,” Nally said. Nally says Holland is working on agreements to purchase renewable power from other wind farms, but he declined to give details until any agreement is negotiated. Holland and all other utilities in Michigan must have 10 percent of their energy come from renewable sources like wind by 2015. Nally says Holland is still on track to meet that requirement. The recession forced many small manufacturers to find new products to make in an attempt to survive. That was particularly true throughout the industrial Midwest. One Michigan yacht manufacturer is taking risks in new industries to keep its factory open and employees on the job. 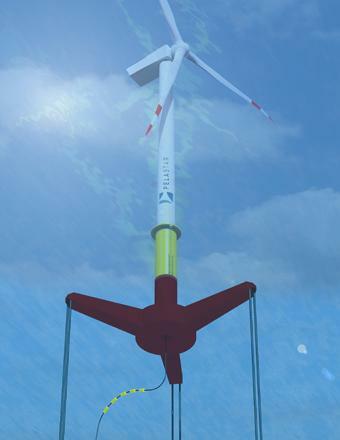 Floating wind farm in the Great Lakes? One major investor could make all the difference for a group hoping to test a prototype of a floating offshore wind farm in the Great Lakes. The group needs about $3 million to apply for a federal matching grant to support testing the floating wind farm concept. 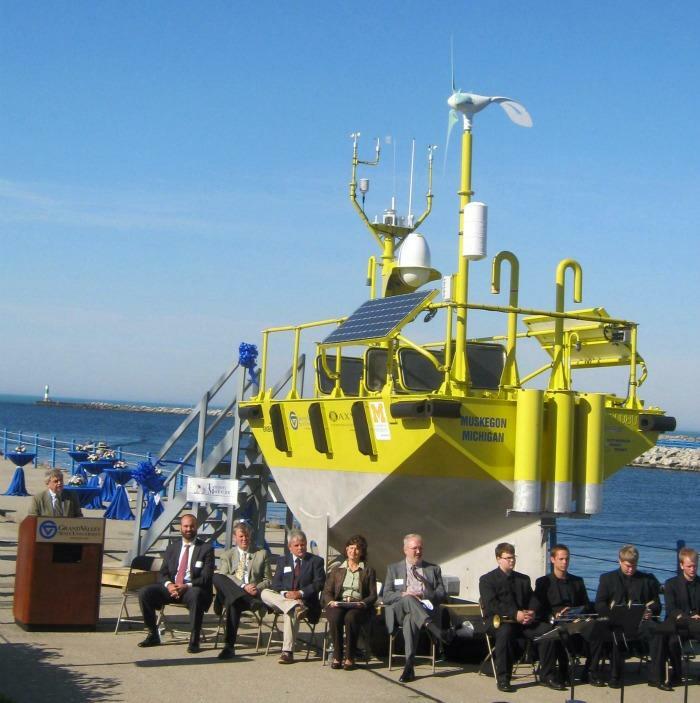 Wednesday state regulators and researchers will head about 35 miles west of Muskegon, near the Michigan-Wisconsin border in Lake Michigan. There they’ll survey the bottom of Lake Michigan to make sure there are no historic artifacts in the way when a floating research platform drops anchor there (likely) later this week. Arn Boezaart heads the Michigan Alternative and Renewable Energy Center. Last year the center operated the buoy only 4 miles offshore. This year it’ll collect first of its kind data that’ll likely determine whether an offshore wind farm is viable in the middle of Lake Michigan. Boezaart says there was a lot more interest in offshore wind data when the project began two-and-a-half years ago.